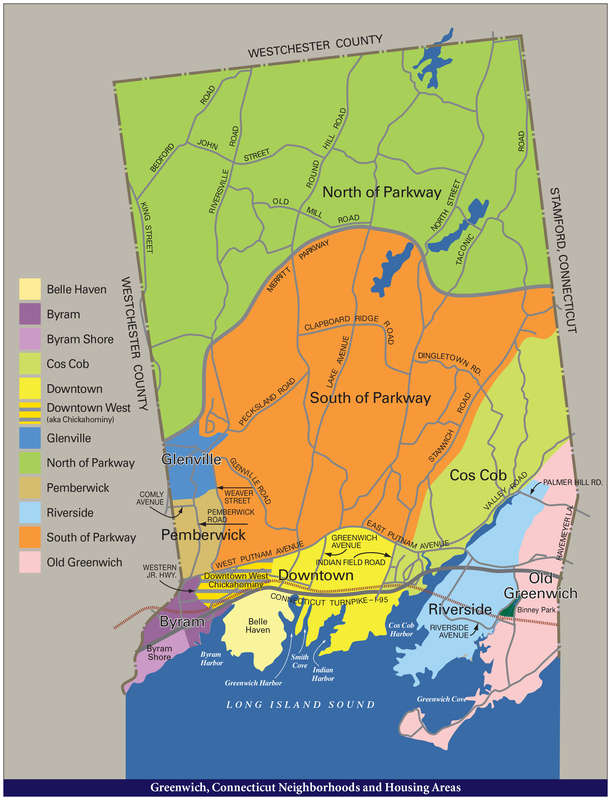 Parks/playgrounds/marinas/beaches: Mid-Country features two parks, the Montgomery Pinetum just east of lower Stanwich Road (and west of Bible Street, Cos Cob) and Thorn Brook Sanctuary on the grounds of Greenwich High School. Mid-Country features four playgrounds and ball fields, all at the public schools. There are no marinas or beaches but with a short drive there are several options. Recreational membership clubs with facilities: There are four recreational membership clubs with facilities in Mid-Country. The clubs are Burning Tree Country Club, the Field Club, Greenwich Country Club and the Round Hill Country Club. Otherwise there are eight other recreational membership clubs with facilities across the Town of Greenwich. Shopping and restaurants: Mid-Country does not have any shops or restaurants because they are prohibited by zoning. The closest shops and restaurants to any Mid-Country location are those in Downtown, Cos Cob or Glenville. Transportation: The mode of transportation in Mid-Country is by car on local roads. Otherwise the roads secondarily convenient to Mid-Country residents are the Merritt Parkway, East and West Putnam Avenue (Route #1) and Interstate 95. Ten minutes from most Mid-Country locations is the Greenwich Train Station. Travel time to mid-town Manhattan, no matter the mode of transportation, is between 45 minutes and 60 minutes. Neighboring Stamford is no more than 20 minutes away.